Sleep hygiene. How do those two words translate into a great night’s sleep? Gwyneth Paltrow refers to it simply as “clean sleeping” within her health and lifestyle website, Goop. But what does that actually mean? World Sleep Society, formerly World Association of Sleep Medicine and World Sleep Federation respectively, created what they call the “10 Commandments of Sleep Hygiene for Adults” back in 2008. Since for the past decade the CDC has reported that 1/3 of Americans do not get adequate sleep, the list of pro sleep tips (that still holds true ten years later) deserves to be shared. 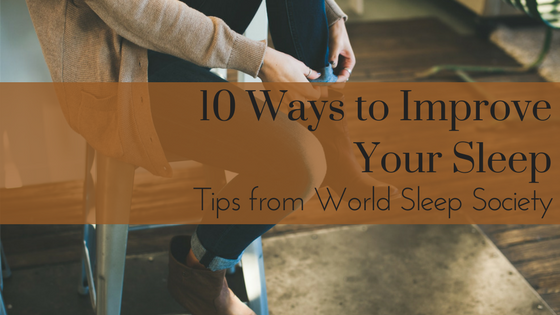 Be sure you have good sleep hygiene by following these 10 Tips for Better Sleep from World Sleep Society. As much as we love Saturday morning sleep-ins, research suggests changing sleep and wake times every weekend can interfere with circadian rhythms. Sticking with the same sleep and wake time every day will improve your sleep hygiene. 2. Allow yourself to take a nap if you’re tired. Taking a nap may aid in feeling refreshed. Just know if you take an afternoon siesta, do not exceed 45 minutes of daytime sleep. 3. Adjust to a healthier lifestyle regarding your substance use. Sleep experts agree you should avoid excessive alcohol ingestion and tobacco use at least four hours before bedtime. 4. Create a caffeine cut-off time. Depending on your bedtime, it’s best to know the exact time to stop caffeine use. World Sleep Society suggests avoiding caffeine six hours or more before bedtime. Keep in mind caffeine isn’t just in coffee. You may want to check the caffeine content of your tea, soda and chocolate as well. 5. Change up your bedtime snack. A light snack before bed is acceptable, but for your best sleep, avoid heavy, spicy or sugary foods at least four hours before bedtime. 6. Watch your workout routine. For your best sleep, experts advise exercising regularly. But if you’re a night owl, you may want to switch your workout time. Exercise right before bed interferes with sleep. If you’re still using that old comforter that makes you so hot you wake up in the night, perhaps it’s time to replace it, for sleep’s sake. Recent studies have found cracking a window open can aid in getting better sleep. Setting your thermostat to automatically drop a few degrees at your bedtime may also help. Electronics in the bedroom distract from sleep. Experts agree, falling asleep in front of the television is on the “poor sleep hygiene” list. Laptops and smartphones make it far too easy to answer emails from bed. But for your sleep health, leave work out of the bedroom or you may start to associate your bed with stress. Following the guidelines of sleep hygiene can help prevent poor quality sleep, short duration of sleep, fragmentation of sleep and sleep deprivation. Sleep deprivation has been linked to a myriad of health issues ranging from mental health disorders to cardiovascular disease. To celebrate healthy sleep and help others learn about sleep’s vast importance, World Sleep Society is also hosting an annual awareness day–World Sleep Day–on March 15, 2019. Let’s all celebrate good health through good sleep hygiene.